This is a brain endocast of a beaver. An endocast or endocranial cast is a cast made of the mold formed by the impression the brain makes on the inside of the neurocranium (braincase), providing a replica of the brain with most of the details of its outer surface. Endocasts can also form naturally, when sediments fill the empty skull, after which the skull is destroyed and the cast fossilized. 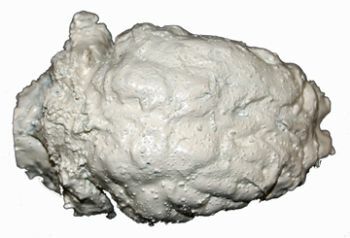 Scientists are increasingly utilizing computerized tomography scanning technology to create digital endocasts without damaging valuable specimens. This gives a 3D representation of the brain. Brain size and complexity can then be determined. Endocasts were used for looking at the brains of homo sapiens to find hemispheric specialization.